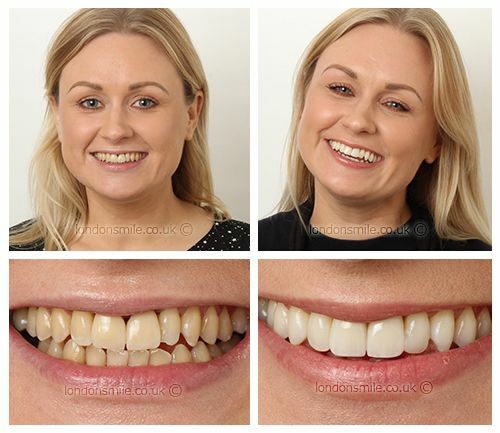 This lovely lady had been thinking of improving her smile for quite some time as she had been feeling very self-conscious but was very nervous of dentistry. Although she is a confident person she always felt her smile was holding her back, then her pending wedding prompted her to eventually come in and meet with us. She had some general dentistry then in-house whitening and two new crowns to give her a stunning new smile and restore her confidence. From start to finish she can’t believe the difference it has made!! It’s been a long time coming but eventually my pending wedding date pushed me to come in. The team really worked around my schedule & times to make it work for me. It has been a mental battle for me that felt very achievable after my first consultation. Each step & treatment has been made easier with the team. I am delighted with my new smile. I would reluctantly smile previously to starting treatment. I feel a lot more relaxed about a camera phone popping up at the moment! I feel more confident and relaxed in general. I would have always described myself as a confident person but felt my teeth were holding me back. I almost can’t believe the difference from start to finish.